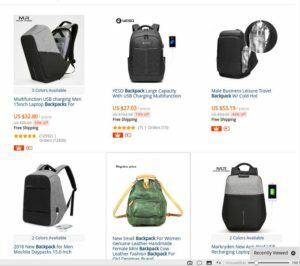 ​If the package damage, please refuse and ask it return back. Do not sign the parcel ,contact with us firstly! 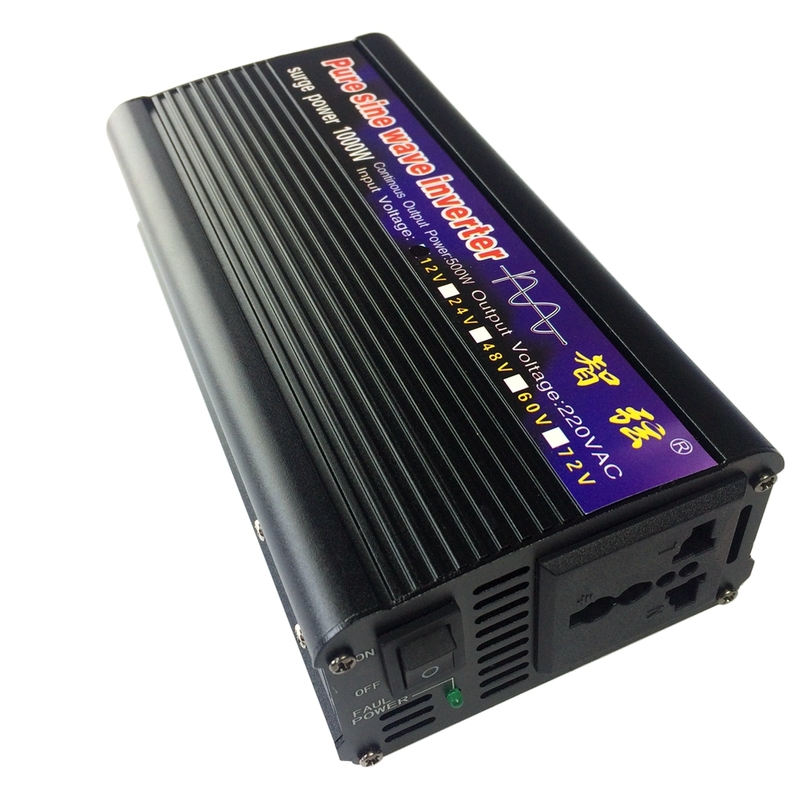 1.Input low voltage protection: When the input voltage is less than 10V ± 0.5V (for 12V input inverter) /20V ± 0.5V (for 24V input inverter), the AC output will automatically turn off, the buzzer sounds 3 simultaneous fault indicator will be Bright (red). 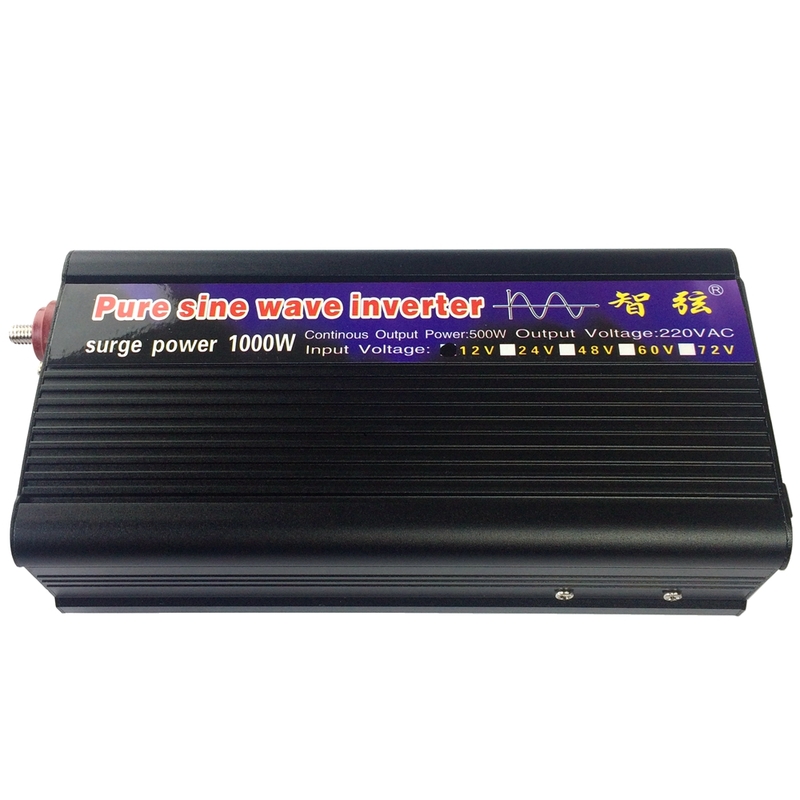 2.Input overvoltage protection:When the input voltage is higher than 15V ± 0.5V (for 12V input inverter) / 30V ± 0.5V (for 24V input inverter), the AC output will automatically turn off, the buzzer sounded 4 simultaneous fault indicator will be Bright (red). 4.The battery is extremely anti-protected:When the positive and negative batteries are reversed, the fuse will fuse to protect the load. 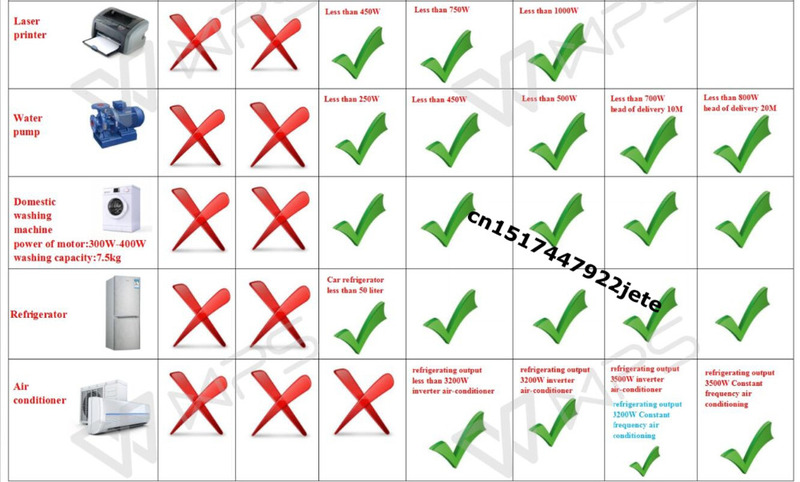 5.Inverter temperature protection:When the inverter temperature exceeds 68 ℃, the AC output will automatically turn off, the buzzer sounded 5 sound at the same time fault indicator will be lit (red), until the temperature back to 50 ℃ after the inverter automatically return to normal. 6.Overload protection:When the load exceeds 110% of the inverter capacity, the AC output will be automatically turned off. The buzzer beep indicator will be lit (red) until the switch is turned off and the inverter is switched on and off. After troubleshooting work status automatically restored. 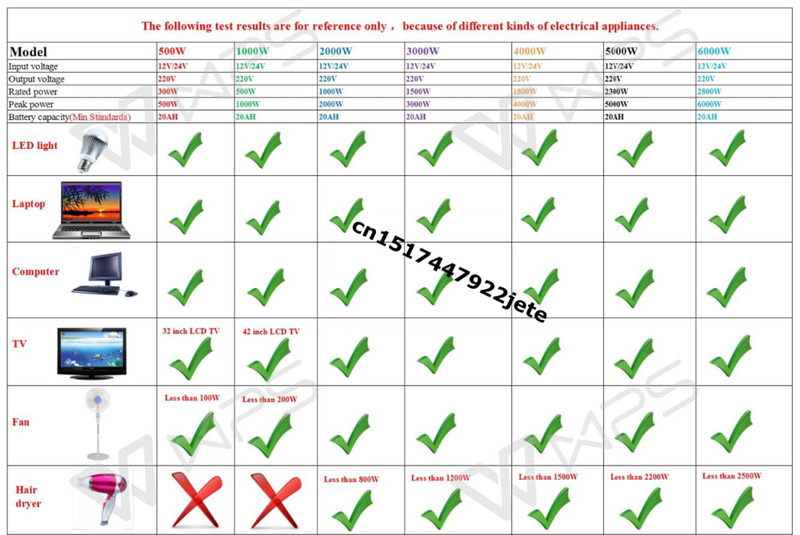 This product is suitable: the output power is less than 500W of various household appliances, such as: TV, computer, fan, light pipe and other household appliances! Note: It can not use for Water pump. 1. 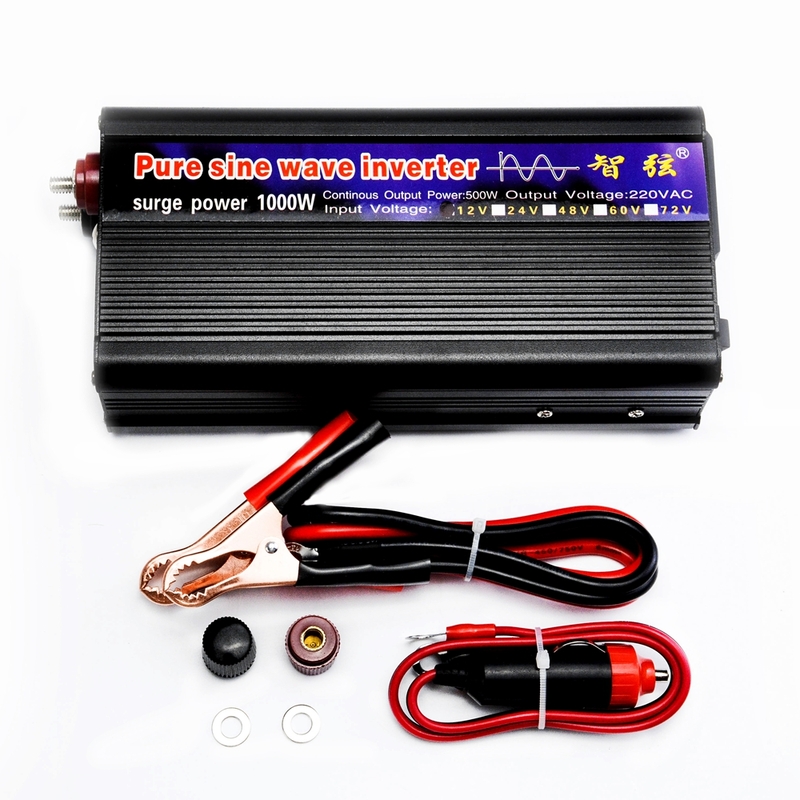 12V’s inverter only can link 12V’s battery (Normal operating range is from 9V to 15.5V) and 24V’s inverter only can link 24V’s battery (Normal operating range is from 19.5V to 28.5V).The inverter will automatically start-up the Over voltage or low voltage potecting systemto shut up the inverter for avoiding the electricity of battery over output cause by the over voltage damage the inverter or working in over low voltage invironment. 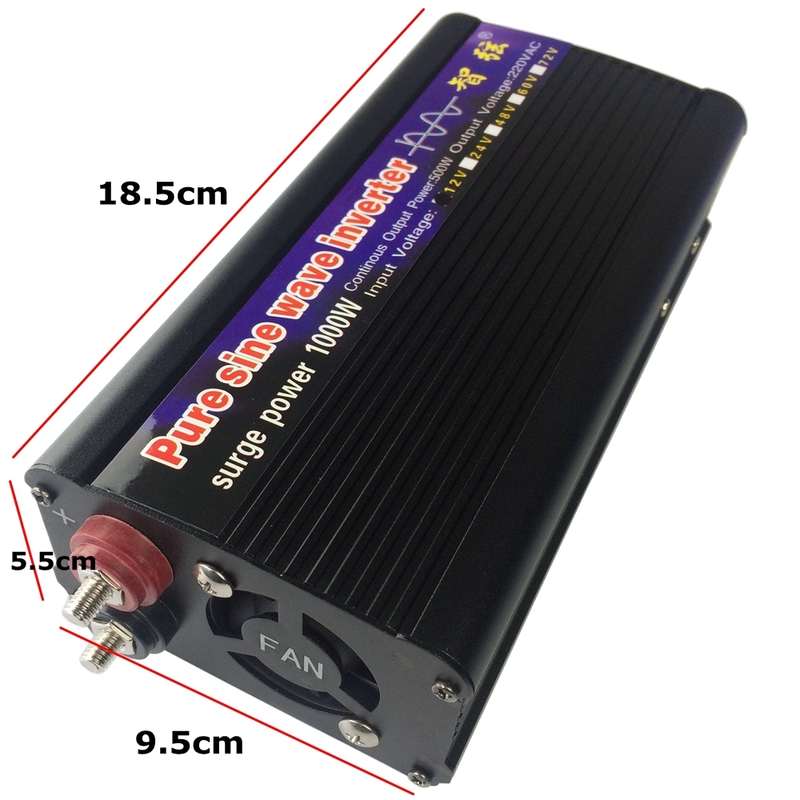 2.This inverter have low voltage warning system,when the inside alarm sounds,indicate the user the electric quantity is seriously low,the voltage of battery is falling quickly,please replace the battery or reduce the rate of power of the electric appliance you using,waining: You have to finish this operation within 15 minutes after appearing the low voltage warning. 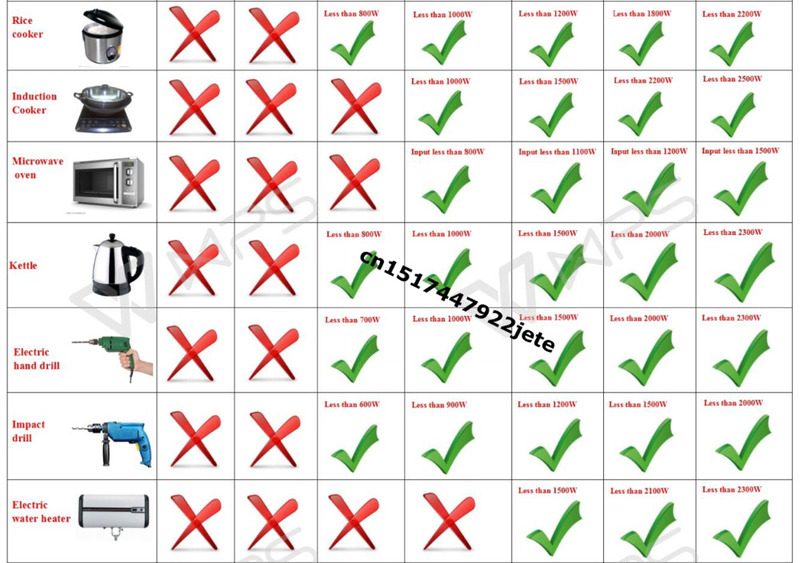 3.When the situations of the electric appliance turn on and turn off by itself continually happened,that is caused by the low of the battery,please replace a larger capacity battery. 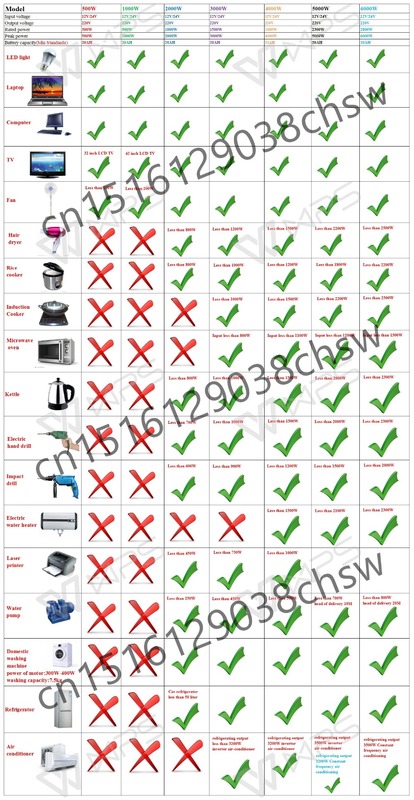 4.The electric appliance still no in working condition after turning on the inverter three seconds,that means the rated of power of electric appliance has overed the allowed rate of power of the inverter. 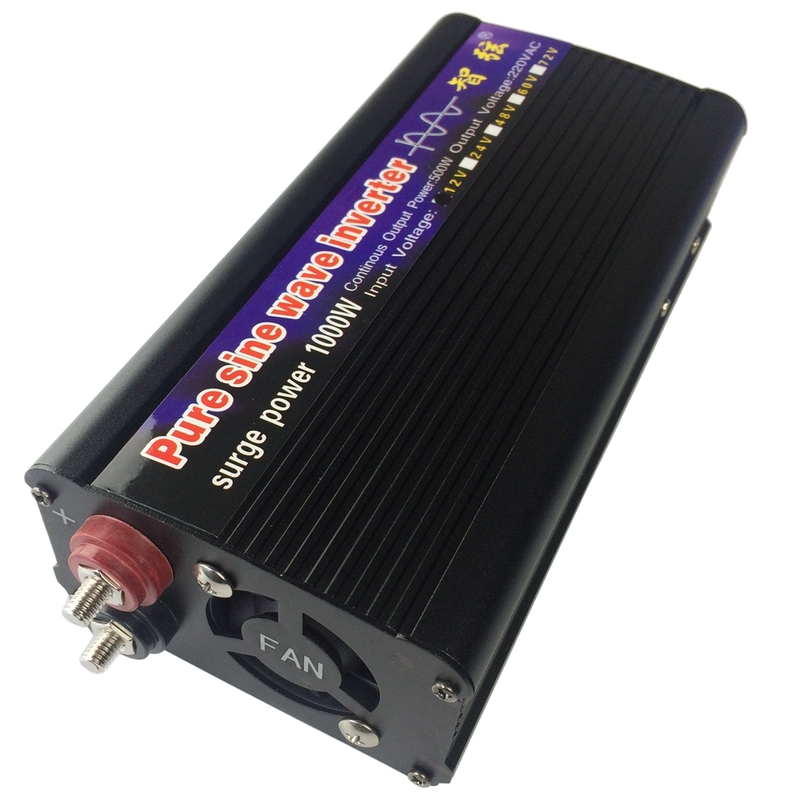 Please turn off the inverter,using the lower rate power electric appliance. 6.The green light “POWER” of output panel is a connect battery indicator. 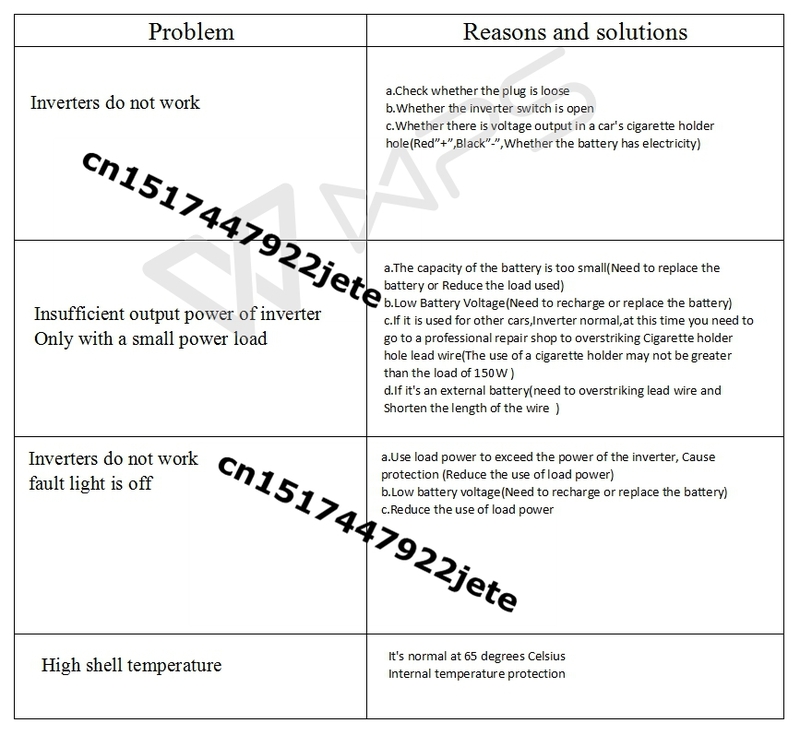 Normal lighting means the battery connect successfully,opposite,may be the battery contact wire is badly connecting,switch have no press to the ON position or fuse burn off. 7.“Fault” green indicate light continually lighting ,means the inverter normally working,light off ,may be the unit inside the inverter damaged or overload protec,when this situation happen,you can try to restart the inverter in no-load condition,still light off,means the unit inside the inverter hace been damaged,continually lighting means the electric appliance over actual power make the circuit protecting system start automatically to shut off the inverter. If there is a twinkling light,maybe it is the short of the quantity of electricity of battery or internal damage. 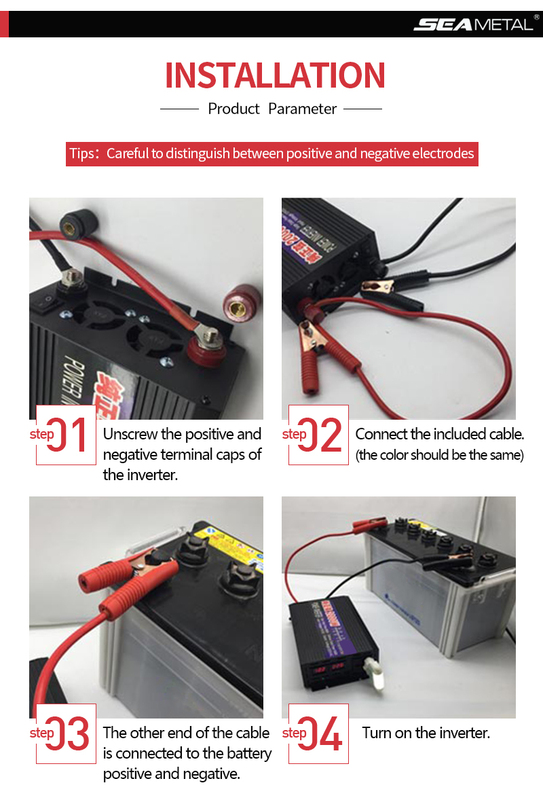 1.Inverters can not be connected to the power grid,can’t touch the AC output line with your hand.The power of the battery connected by the inverter must over the actual consumption of the load.When the battery line is lengthened,the corresponding diameter should be doubly thickened. 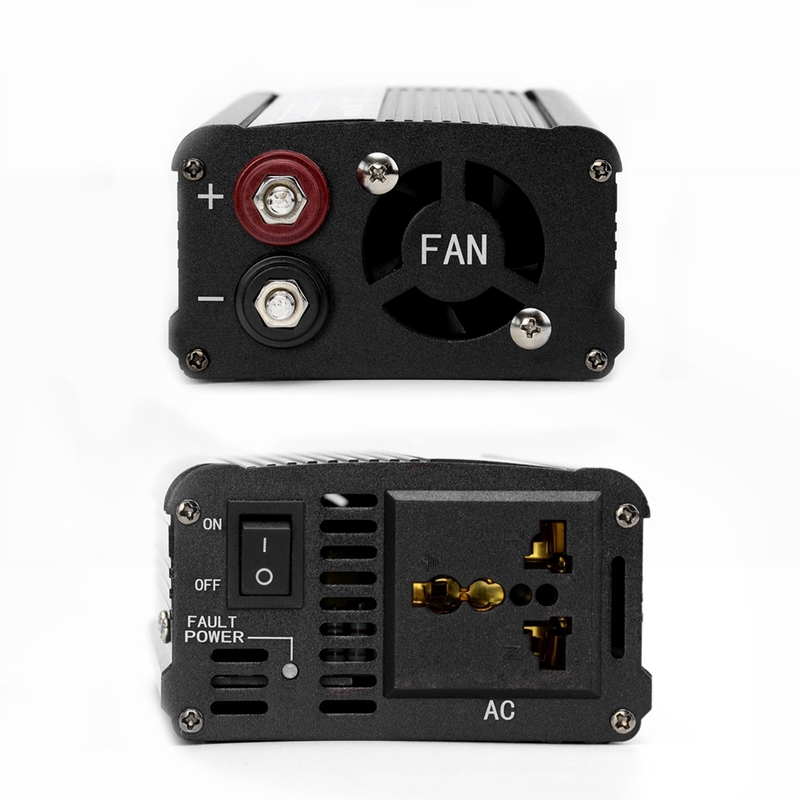 2.The output of the inverter is both fire line,no grounding problem.Do not use any one as a grounding wire,It is not connected to the ground. 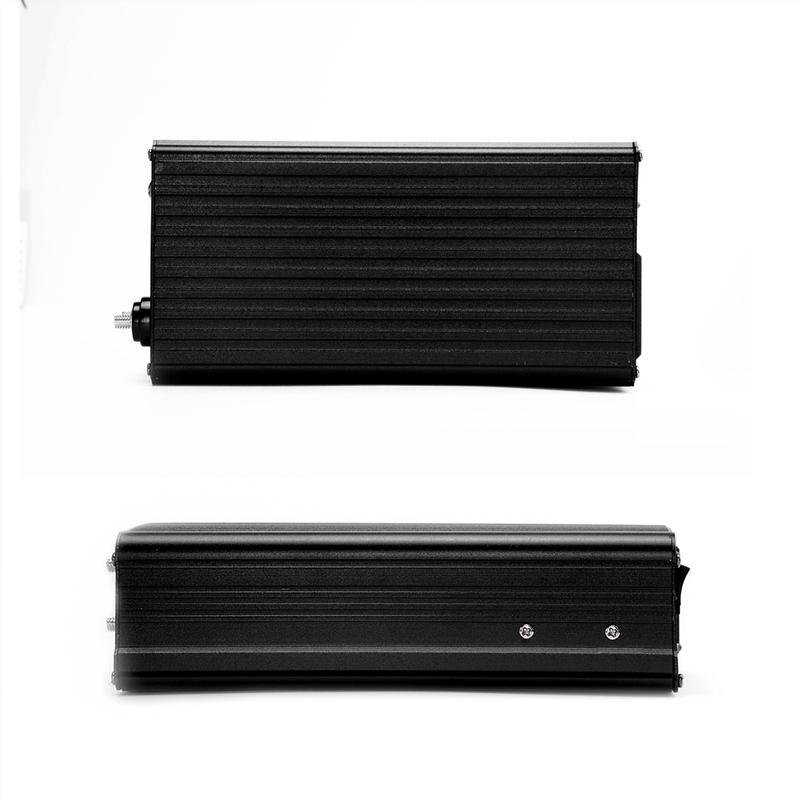 3.Inverter and load connection,do not connect any air switch or leakage protection switch in the middle.Not only does it fail to protect it, but it will damage the inverter.